Hey you guys! So this post isn't within the normal stuff I usually post, but I just had to share this with you guys. I was contacted by a representative from GlassesShop.com, an eyeglasses online shop about receiving and reviewing a free pair of eyeglasses. I was a little hesitant because a) I already have glasses, b) I'm not a fashion blog nor do I have a sense of style, and c) I didn't see the connection to my book blog. But then I realized, that most of you readers probably have prescription eyeglasses or use some sort of reading glasses. And even if you don't, you might be like me and want some sunglasses to read outside with during these nice summer months. So I asked them about sending me some prescription sunglasses and they sent them with no sweat! I just had to give them my prescription and pupillary distance. Above is a picture of me wearing the prescription sunglasses and below are some more pictures. I love these sunglasses! You guys have no idea how long it has been since I have worn sunglasses since I have prescription eyeglasses that I usually wear. These aren't too dark and I love the style. I was a little hesitant getting these because I usually like thicker frames, but I'm really happy with these. The great thing about GlassesShop.com is that they have a ton of styles to choose from, multitudes of different lens types, a cool tool you can use to see how the glasses might look on you, and your glasses come with a free case and cleaning cloth! As a gift to you guys, I have a code to share with you guys for you to get 50% off eyeglasses or sunglasses with free lens (sale frames excluded)! That code is GSHOT50. And even more exciting, is GlassesShop.com offers one free pair of glasses per customer and prescription for those getting their first pair with code FIRSTFREE! 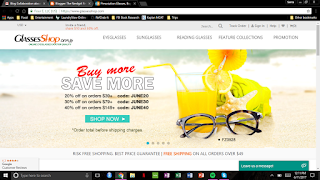 So whether you are in need of some new prescription eyeglasses, want to give prescription sunglasses a try like me, need reading glasses because of all the summer reading you're about to do, or just want some nice looking glasses to look great in your bookstagram pictures, GlassesShop.com has options for you. Their options are cheap and perfect for introverts like us who don't like going physically shopping. Disclaimer: I was not paid to make this post. 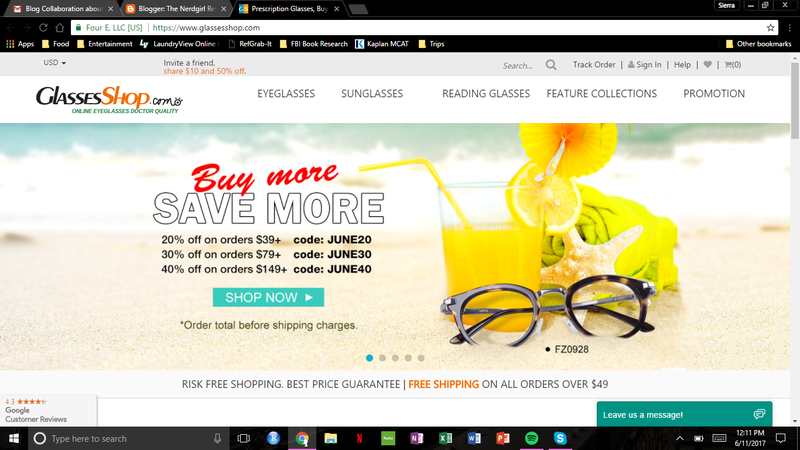 I only received a free pair of prescription sunglasses in exchange for an honest review and promotion of their website.